My recent purchase of a MacBook Pro, which required a lot of encouragement from Facebook followers, brought up a lot of inquisitions. Many people asked whether there are companies that will allow you to work online using an Apple computer. It is true, many companies use software that is only compatible with PC and therefore they do not hire people with only Macs. However, if you prefer to use your Apple based computer and wish to work from home, there are still several options. 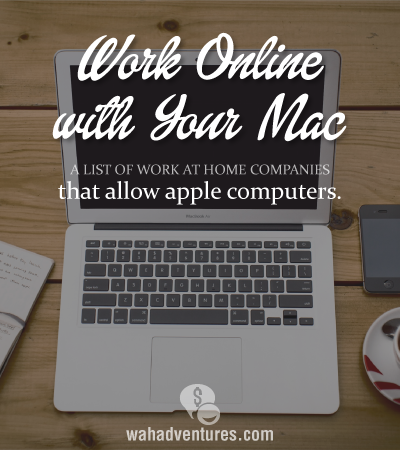 Work from home for Apple! They of course would love that you are familiar with their products. Apple customer support members are actually provided a computer with iOS as one of the many perks to being an employee for Apple At-Home. Website usability testing sites like Usertester.com and Userlytics.com allow for Mac iOS computers to earn money online. Get paid to review websites or even mobile apps. Spend about 20 minutes of your time and earn $10. Leapforce and Lionbridge both offer a variety of search engine evaluating jobs that allows for Mac computers. This is a great flexible and non-phone work at home job type. Although the work load is not always stable, it pays well and the flexibility allows you to work around other jobs. VoiceLog contracts phone operators to work from home. Their setup is compatible with Apple computers using the most up-to-date iOS. Working with VoiceLog guarantees you a minimum hourly rate of $8.50 an hour and has a flexible working schedule. This excellent transcription opportunity pays on a project basis between 10 and 30 dollars an hour! Previous experience is not required but you must have excellent English and Grammar knowledge. And you guessed it, they allow Mac computers! If you prefer to use your Mac but the work at home job you dream of only supports Windows – there is a simple solution. You can use Apple’s Boot Camp product to run Windows from your Mac. Many people do this without any issues. Regarding: Voice Log, Information not provided in position announcement. I received an invite from Voice Log, bsgclearing.com, but, after I sent them all of my computer information, they told me there is a required typing test. I inquired about the required typing speed, and, I was told 40 – 45 wpm. I had already stated in my resume that I type 25 wpm.